First, she was not as much a spy as the blurb let me to believe. But then who cares about that. This was Lena steering through the danger of the blood court, at a time when most vampires seems to forget about the old thrall contracts. And the Echelon debutantes do not have it easy. Back to the start then. In book 1 Lena flirted with the beast, Will Carver, werwulfen and a dangerous man. In book 2 she is a debutante looking to be a thrall to some powerful vampire, while dodging some. Will does his best to try and forget her. His kind does not mix with humans, it's too dangerous. Lena does do some spy work, a bit of telling about things she hears, but she is not happy about how some do things. And I feel conflicted. I do want the humans to be free. But at the same time there are good vampires too. So what should happen? I just do not know. This is a world that will go up in flames soon. And what will then happen to Blade and Will, well they will die. Conflicted yes, as some vamps are so evil too. Anyway, romance, Passion! Danger! That is what this book will bring you. Steampunk? Eh, not so much. But it was a good book. I am giving away a copy of book 1, Kiss of Steel, so that you can get started on this series. Thanks to Soucebooks. Thank you so much for this giveaway! i really want to try this series so winning the first book would be wonderful! Thanks for the giveaway! I've heard so much about this series and I love steampunk. Romance, passion and danger are pretty much my favorite things to read about. :-) Glad you enjoyed this, it sounds awesome! I'm not entering the giveaway because sweet karino bought me a copy of book 1 but I really need to get into it! Need more time!!! Can I join you both on that reading vacation? What no cover commentary on this one? I haven't heard of this series but it sounds fun. I hate it though when it is billed as steampunk and there is little steampunk! Oh well... enter me! Sounds lie a good read, as long as you're not looking for steampunk over romance. Thanks for the giveaway! This sounds really good. And I haven't read much steampunk. It doesn't sound very Steampunk-ish - not that I've read any Steampunk (yet)! I'd love to give it a try though. These covers are pretty cool, even if it wasn't too Steampunky. I' d love to read KISS OF STEEL thank you. Love the cover. Which part was, in your opinion, better? The first or the second one? Which of the heroines you liked best? First time I hear about this book/series. Love the cover by the way. Ooo book one is on my wishlist and you have me excited about book two. I love that you are torn. Alright, count me in. Those covers look BEAUTIFUL, and the series hold some promise. 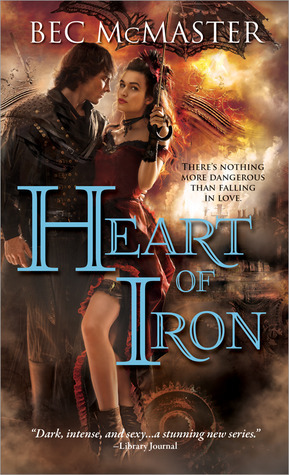 Sighs...wish I was into steampunk...this sounds so cool and I ADORE the cover. I want some steampunk..I think anyway!! Sounds good! You know, I'm not sure why I never started this series, it looks like something I would enjoy, since I do like Steampunk reads, and throw in the paranormal,I'm sold! It's too bad #2 didn't have more of the steampunk elements. Thanks for sharing! Sounds like a great read, and I love the setting. Please enter me. Thanks! Hmmm, this really sounds interesting. Please count me in! oops, forgot to add email!